We pay for REG mail and UPS (normal 3-6 Bus Days(…BUT…we offer quicker mailing at YOUR COST. Nxt Day…2nd Day…3rd day or Priority Mail. If you choose faster mail service you will need to either call in your order or place it thru CONTACT US with all credit card info…it will need to be weighed to verify postal amount. ****-INTERNATIONAL ORDERS-*….please note..our web site is not set up to accept international orders but if for some reason your order IS accepted…there will be an additional $3 per bag handling fee PLUS postage that will need to be added to your order. You must call or email credit card info in order to complete your order. 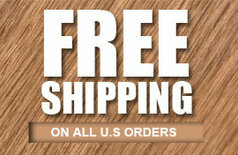 Total of order will be calculated and you will be notified BEFORE shipping for your approval. ****-ALL ORDERS OVER 4 BAGS will be shipped UPS! a PHYSICAL ADDRESS is needed…NO P.O BX DELIVERY!! We’re not just blowing smoke. 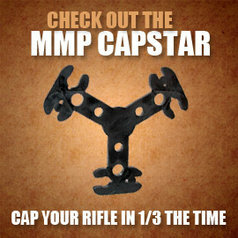 MMP Sabots, paired with properly selected bullets, DELIVER. MMP Sabots, when matched with muzzleloading specialty or modern pistol bullets, offer the blackpowder big game hunter unparalleled versatility. 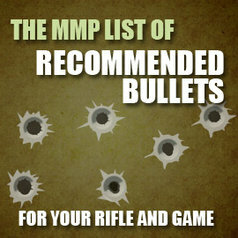 MMP Sabots and properly selected bullets deliver. With the vast selection of jacketed, cast, or swaged bullets available, hunters can select the right bullet for Pronghorn, Whitetails, Mulies, Elk, Moose, Bear, Whatever your game! Prices are for a bag of 50. 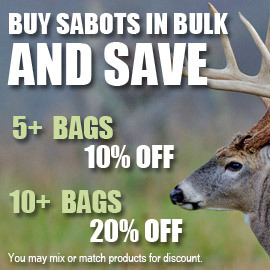 Discounts available for purchases of 5 bags or more.